Banana bread is the perfect go to dish for breakfast, brunch or even dessert! With several choices to choose from, banana bread recipes are diverse. Each of these delicious banana bread recipes could be named supreme, we’ll let you be the judge. We've put together a collection of the some of the best moist banana bread recipes we could find. If you’re crazy for chocolate we’ve got a great moist chocolate chip banana bread recipe for you. If you’re looking for something with an added crunch, try our banana nut bread recipes with almonds or walnuts. Keep in mind-if you’re in search of a moist banana muffins recipe you can still use these banana bread recipes, just switch baking pans! Whichever dish you choose to make, one thing’s for sure: you’ll love these super moist banana bread recipes. Quick Banana Bread -Nut-lovers and non-nut lovers can unite in making Quick Banana Bread. It's a banana nut bread recipe that can be made without the nuts! In search for moist banana muffins recipes? You can use this recipe to create muffins as well. Quadruple Banana Bread -This Quadruple Banana Bread Recipe will have a cook making enough banana bread to satisfy that banana craving for weeks--and it can all be made in about an hour! Stir 'n' Bake Banana Bread -Stir 'n' Bake Banana Bread is as easy as throwing all the ingredients together, stirring them and baking them. This is going to become one of the easiest banana bread recipes you've ever tried! Walnut Filled Banana Bread-Walnut-Filled Banana Bread is an easy recipe perfect for walnut lovers. For those who prefer to leave the walnuts out, the bread will still turn out to have a great taste minus the crunch. Fluffy Banana Bread -Fluffy Banana Bread is an easy recipe for when you're looking for a sweet, fruity dessert or snack. This is one of those moist banana bread recipes you'll make again and again. Stay Fresh Banana Bread -For an easy way to make banana bread, try the stay fresh banana bread. The moist, spongy bread tastes great for days. You'll enjoy a homemade baked good for longer with this basic banana bread recipe. Chocolate Banana Bread -Basic banana bread is great, but chocolate makes everything sweeter. For a tasty treat, try chocolate banana bread which combines an unbeatable fusion of flavors; easily one of the more rewarding moist banana bread recipes out there. Almond Banana Bread -Almond Banana Bread delivers a homemade favorite with an added crunch. Nuts, spices and lemon peel are used to create a unique dish that's sure to please. 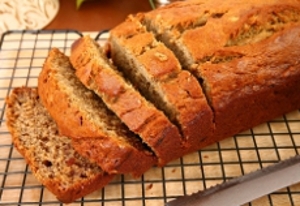 Aloha Banana Bread -Tangy sour cream cuts the sweet taste of banana bread. For moist banana muffins, just use a different pan. Make this easy banana bread recipe for dessert tonight! Banana Cream Bread with Chocolate -Banana Cream Bread with Chocolate makes a delicious triple-threat dessert! It's got a creamy sweetness that can't be matched by plain banana bread.